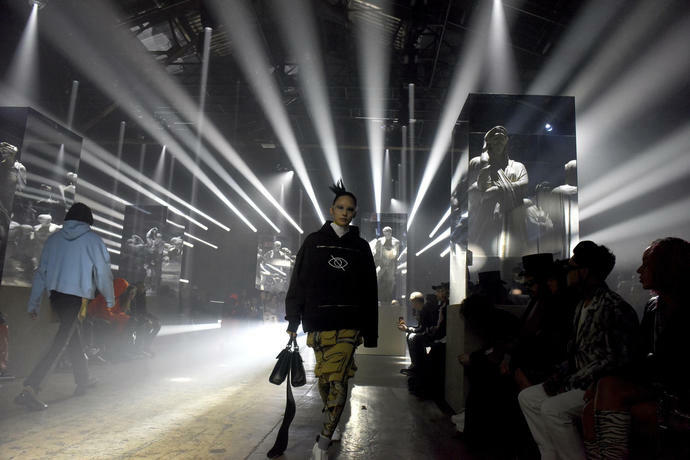 NEW YORK (AP) - With a strobe light show worthy of a seizure warning and classic statuary in clear boxes, Milan streetwear cool guy Francesco Ragazzi brought his celeb-popular Palm Angels brand to New York Fashion Week on Friday for the first time. "A new challenge. I always start with a new challenge, and definitely New York is a great energy. I'm trying to bring my own vision here, just trying to tell my story," Ragazzi told The Associated Press before his models - both men and women - lined up for one last look prior to showtime. Ragazzi does consider himself driven by his celebrity fans. Before decamping Milan for New York, Ragazzi hoped New York would drop a few A-listers onto his front row. He got French Montana, the rapper Gunna - he smoked throughout the show - and a giddy Alexander Wang.